My tour of Atria Marland Place was fine. The place was well kept, clean, and big. The rooms were average but in good condition. The residents I saw seemed fine. Thank you for touring the community. We appreciate you taking the time to leave your thoughts. Atria Marland is nice. It is in a nice location. The place is very neat and clean, and they have a lot of activities. I appreciate you bringing your concerns to my attention, and I'd like to help. Would you mind emailing me at customerservice@atriaseniorlilving.com? That way I can learn more and share this information with those who are best positioned to address the matter. My husband was at Atria and repetitively acted up due to lack of attention and improper care. It is on this basis that I say the memory care unit at Atria in Andover is not appropriate for residents with Alzheimers or advanced dementia. While a beautiful facility, many caregivers are untrained and ill-equipped to handle difficult behaviors that are common to Alzheimer patients. Individuals with unique needs are seen as a burden and problem. With the exception of a few loving caregivers (real angels), a number of caregivers just want to do their jobs and go home. Some members of management lack empathy and come across as detached and uncaring. There's a cookie cutter approach to care. I would not hesitate to recommend Atria for assisted or independent living but not for memory care patients who need a higher level of care unless you are prepared to move your loved one quickly to another facility or have the means to supplement their care with extensive outside help. Now that I am in another and much better facility, I can see the difference and happily report that my husband no longer acts out and is very content I can go and enjoy him with peace of mind knowing he is loved and well cared for (something I didn't have at Atria). Thank you for taking the time to tell us about your experience with Atria Marland Place. Your comments are concerning to us, and we’d like to learn more about your situation. If you’re comfortable sharing more information with us, please reach out to us at customerservice@atriaseniorliving.com. We went to Atria Marland Place. It seemed OK. They treated us to lunch, and the food was very good. However, the rooms were rather small. It was quite a long walk to go to the dining area, and my husband wasn't too happy with it. Plus, I thought the upfront costs were a little higher than what we could manage right now. Thanks for visiting our community. I’m sorry to learn that it isn’t a perfect fit for you husband right now, but welcome you back any time. If you want to share any other feedback, feel free to send me an email at customerservice@atriaseniorliving.com. My mom is now at Atria Marland Place. We interviewed with them and decided that we like what they offered. At Atria Marland, they were upfront with everything. Unlike just about every place that we called, they did not tell us about the upfront fee until the very end when we were considering it and getting close to contracting with them. The upfront fee ranged up to $6000 and it's no refund. So if your parent happens to get sick just before they are about to move and can't move in, you would lose the money ? period. No refund. Atria Marland Place is a very nice place. My first impression of it was that it was warm, inviting and welcoming. The residents seemed happy. They were warm, friendly and inviting to my mom. She is in a shared room and this is one of the things that sold us on for this particular facility because it has a shared main living area, the living room-kitchenette area. Each of the two occupants has their own spacious bedroom and bathroom. That?s really ideal because they can be together when they want to be and they can be private when they want to be. Regarding the staff, since my mom has been there, we have been very pleased with them. They are being very helpful and friendly. My mom loves the aides. She thinks they are the nicest and sweetest women and she calls them "her girls". The food is excellent. The dining room's ambience is very nice. The wait staff is very friendly and warm. They are just cheerful and fun. They would joke around with the residents. For activities, they have groups coming in, they have parties at different holidays, they have movies, games and card games and then they also have exercise classes. They even have a van that takes them to places. Overall, we are delighted with it. Atria was very well organized. The staff that I talked to seemed to be knowledgeable and friendly. I liked the building, it was an old fashioned building that was done over. You always felt that it has a lot of room and not cramped. We had dinner there and it was excellent. It was well prepared and well presented. The facilities were restaurant style and were nice. Atria Marland Place is in the same town that my dad grew up in. Its apartments are nice. The activities are good. It's as good as we can do. It was a really nice living facility in a really wealthy upscale town. It is a peaceful place that looks newly renovated and taken care of really well. There service is good and all the people working there were really friendly and quick to help. Also it seemed like they really cared for the people living there and it seemed like a nice place for someone to live. The best thing about it though was probably the food and waitstaff they had. It seemed like the food was catered because it was very high quality and seemed very fresh, which is much more then I can say for the other assisted living facilities that I have been to. There is also a good amount of parking that is available, it is also a very safe place to park and just generally be at. There is little to no crime in the neighborhood where it is and it seems incredibly safe which is crucial for it to be a good home. For Alzheimers, Life Guidance units, level of care is very limited, and you will quickly see the need for alternate placement. Thank you for your review and I would like to address your concern about the care levels of our Life Guidance memory care neighborhood. Each new resident receives an assessment at the time of move-in and periodically during his or her stay. These assessments help us tailor services to individual needs. We offer 3 levels of care for our residents with memory impairments, and additional personal care of up to 21 hours per week is available based on assessment results. Care may include personal grooming assistance, assistance with self-administered medication management, escorts, accommodations for special diets, and incontinence care. If a resident requires more care than we are able to provide, we work with the family as they consider their options. In addition to our personalized assisted living services, Atria provides a specialized program called “Sharing the Way” for people with Alzheimer’s and other forms of memory impairment that can mean more positive experiences for residents and families. Our program features supervision 24 hours a day from specially trained caregivers, familiar routines, structured involvement and reminiscence activities, a custom-designed neighborhood with secured entries and exits, focus on abilities of each resident and individual quality of life, delicious dining served in a more intimate setting, personalized wellness care plan, housekeeping services and laundering of bed linens, personal care assistance and medication management, maintenance of apartment including necessary repairs and replacements. We are always happy to discuss the needs of any family researching memory care options. Feel free to contact us at any time with questions. Atria Marland Place has a variety of levels of care and religious services that are right in the building. They go out of their way to have on-site activities that have been requested. The main thing that strikes me about it is that it's secure. They have their own parking and you can't walk in without being seen by someone which I thought was pretty good. The staff is well-trained and knows who the residents are and what their special requirements might be. It was surprising how well they knew everyone. We chose Marland Place because it was close and very nice. Their rooms were the best that we saw. The food is great, and it is very clean, very well-maintained, very bright, and cheery. It is a very nice facility because it is placed in a really nice town of Andover, also the employees are very friendly and patient. It is clear to tell that this would be a difficult place to live due to the nature of the residents, but the employees always seemed to stay very happy and easy to deal with. I have heard the food tastes good but I have not tried any or seen to much of it at all. All in all it is a very nice facility and I would recommend sending a loved one to it. For more than 18 years, Atria Marland Place has been the senior living provider of choice for Andover’s wisest older adults. Building on this foundation of trust, they’ve recently completed a thoughtful, thorough renovation to expand and enhance their community – including the addition of Atria Marland Falls, an independent living residence located in the fully restored east wing of the community. Residents enjoy a host of exciting new living spaces and upgraded amenities including a new fitness center tailored to seniors, a full-service salon and spa, new lounge with bar and grill, a modern bistro, custom-designed movie theater and an expanded Life Guidance&reg memory care neighborhood with a new restaurant and outdoor garden deck. 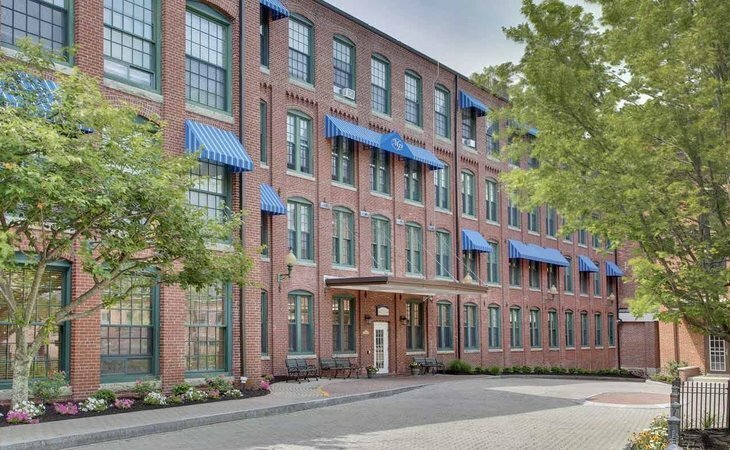 Located in a renovated historic mill on the banks of the picturesque Shawsheen River, Atria Marland Place is comfortably situated on the north end of Andover’s town center. This vibrant assisted living community is convenient to many of the area’s best shopping, dining and entertainment destinations. Atria Marland Place offers private apartments, a professionally certified, 24-hour staff, and a full range of personal care services, including medication reminders. Residents enjoy full-service dining experiences, an active social calendar, housekeeping services, local transportation, and a warm community of friendly neighbors. Most importantly, residents and their families experience greater peace of mind knowing that professional assistance, if desired, is available around the clock. Guided by a tenured management team with extensive experience and a proven reputation in senior living, Atria Marland Place is committed to providing residents with exceptional accommodations and a superior level of service. What should caregivers and potential residents know about Atria Marland Place?